Today was less about appreciating our national parks as it was a day to appreciate running culture. Even though I'd gone to bed at 2 (David and I had lots to catch up on), I rose at 6:45, because I wanted to tag along with David and visit Nike's campus. After a cup of Chemex-brewed coffee and some delicious pastries from a bakery in the Pearl District, we were off to Beaverton. When we arrived, I was lucky enough to park next to the spot reserved for Michael Jordan. I looked around and noticed that the section of the lot was filled with celebrity athletes--Dwayne Wade, Carlos Tevez, Kenenisa Bekele, Manny Pacquiao, Rafael Nadal. David took me on a walking tour of the campus. 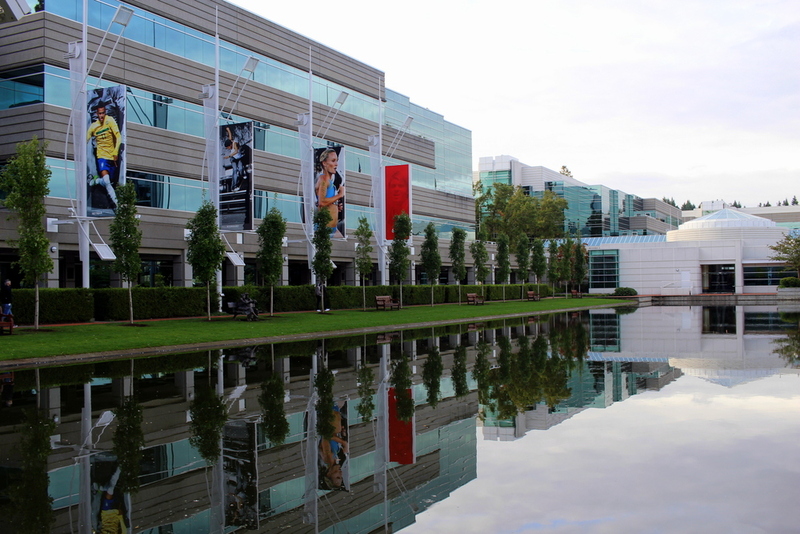 I could immediately feel Nike's commitment to athletics while walking around the vast campus. Evidence of that commitment was visible, too--banners and plaques celebrating and memorializing past and present Nike athletes were everywhere. Despite Nike's influence on sports generally, I was particularly interested in the visit because of Nike's role in giving birth to modern American running. 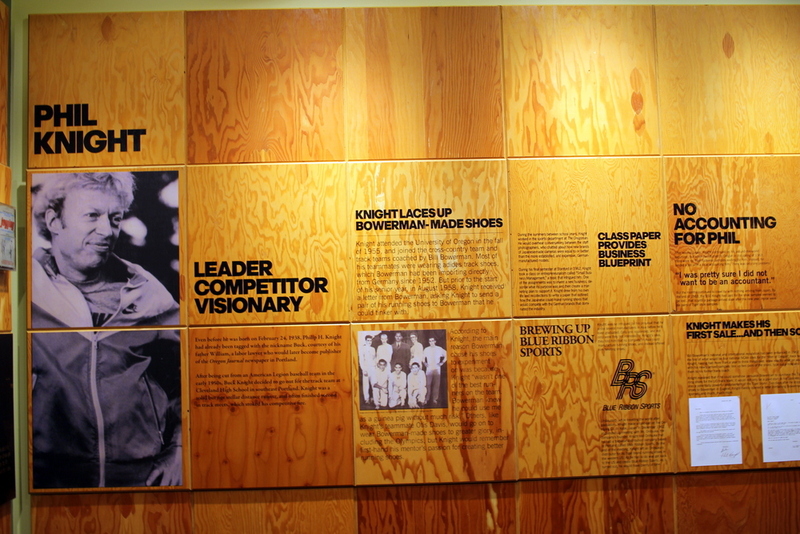 Nike started out as a fledgling company that made track shoes in conjunction with legendary University of Oregon track coach Bill Bowerman. It's now the sports behemoth that it is because of that unique beginning. 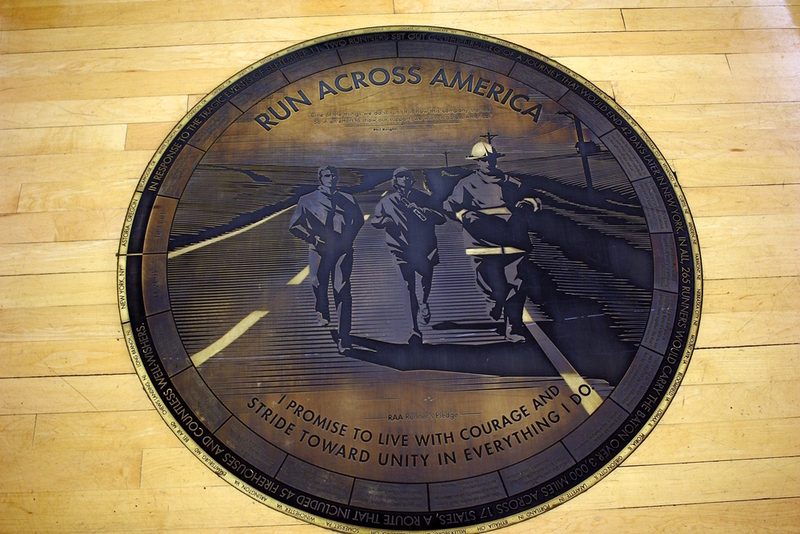 In the main entrance, there was a brief exhibit on Nike's running past. I particularly enjoyed the segment on Steve Prefontaine. Every serious runner admires Pre, not only for his sheer athletic talent, but also for his work ethic and spirit--all of which were simply unrivaled when he was dominating the world's running scene in the 70s. I thought back to my high school cross country running days, when my teammates and I would quote Pre and watch "Without Limits" the night before races. In fact, I was on my way to Eugene, Oregon, to pay tribute to him by seeing his storied hometown track, Hayward Field, and running on the jogging trail created in his memory, Pre's Trail. After another cup of coffee in Nike's cafeteria, I bade farewell to David. 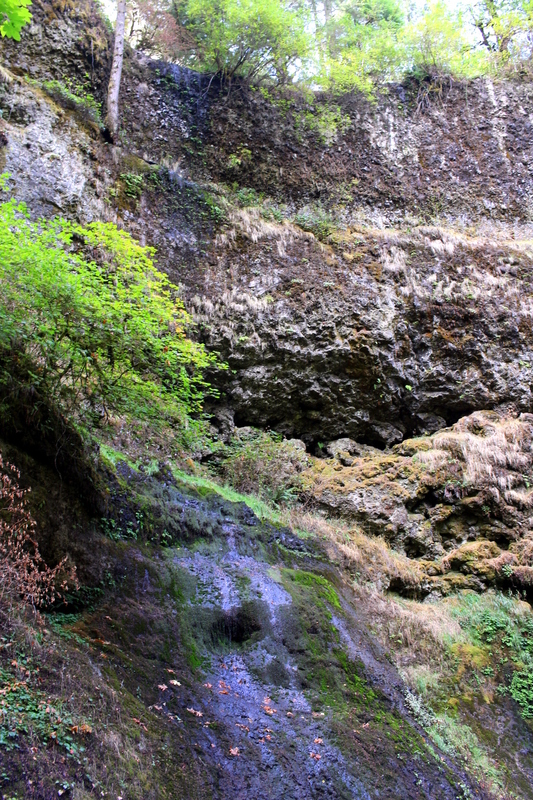 I headed in Eugene's direction, but I wasn't about to go there without doing a beautiful trail first. 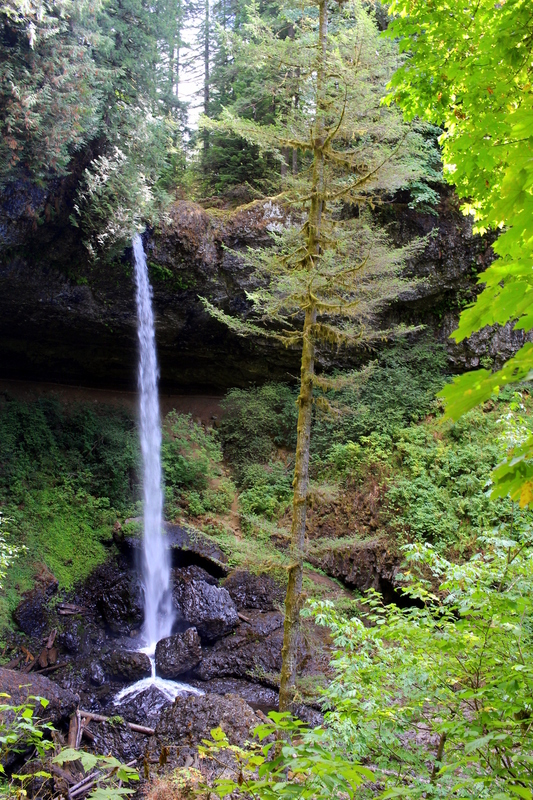 On one of the Stumprunner runner's recommendation, I decided to run the Trail of Ten Falls at Silver Falls State Park. I've already noted how we have so many national monuments that often go unseen. The same goes for state parks. In fact, for various reasons, there are probably state parks out there that are even more beautiful and awe-inspiring than some of the spaces managed by the National Park Service. 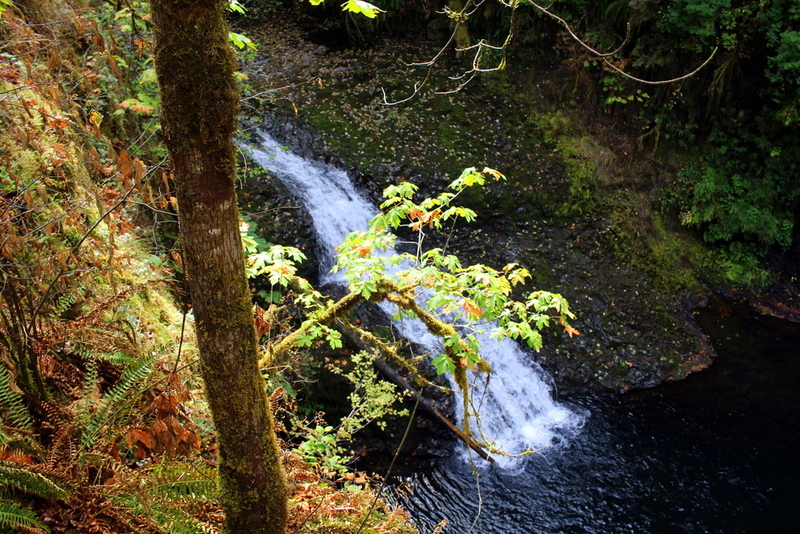 I can say with confidence that Silver Falls ranks pretty high. 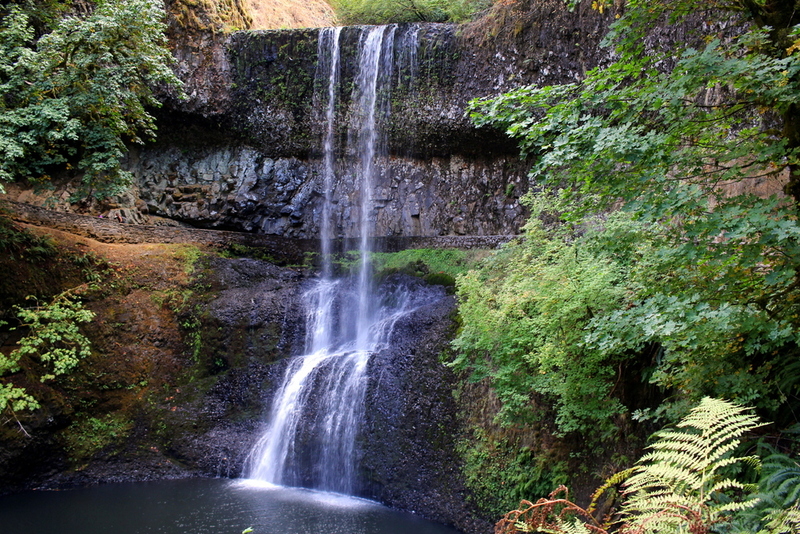 What was particularly impressive were the falls that had trails that cut under and behind. I thought about how this had formed. I also wondered how several other features reached their present form, like one giant boulder that lay in the middle of the river. I'm glad I made the stop. The trail was really easy to run on, and had undulations that felt good for my feet. I was also testing the Nike Terra Kiger trail shoes that David had given me. They felt good--perfect for non-technical trails like this one. I'd made the circuit in just under 90 minutes. When I met the park ranger who'd greeted me earlier, he'd said it would take 3-4 hours. I bumped into him as I was heading back to my car, and he asked me how long the run had taken. When I told him, he couldn't believe it. I told him I was a trail ultrarunner. He laughed. I now proceeded for Eugene. On the way, I stopped at Burger King and chowed on a Double Whopper meal--my first in probably at least a decade. I normally don't eat that kind of fast food, but for this trip, I'm okay with it (more on nutrition later). I arrived first at Hayward Field. This is the University of Oregon's historic track and field stadium. This was Prefontaine's home turf. In fact, the prestigious Prefontaine Classic is held each year at Hayward Field and is named for him. Sadly, I was unable to get inside the field, but I had to take a photo from outside the main gate. I'd already done a run for the day, but I felt an itch to do more. Specifically, I decided I'd drive over the Willamette River to Alton Baker Park, home to "Pre's Trail"--a 4+ mile, woodchip trail created in Pre's memory. He'd always loved running on the soft surfaces he'd found while traveling in Europe, so he'd set into motion a plan to create a soft trail in Eugene. Sadly, he died before that happened under his watch. The trail was soft and springy, and I made a comfortable pace around the park. For the first time all trip, I ran without my fastpack; I had nothing weighing me down. I thought about Prefontaine--his spirit, mostly--and imagined what it would be like to run alongside him. It was liberating. After finishing my run, it was already 6 p.m. I'd made a decision to stay in the area using Airbnb again because it was supposed to rain at night. I drove over to Springfield, met my awesome hosts, showered, and hit main street's Plank Town Brewing for a couple flights of beer and a delicious meal to go with it. Today felt different. It felt like a day to go back to one's roots. Prefontaine was one of my early running heroes. 40 years after his death, his spirit lives on.